A superb way to convey your thoughts on Mothers Day, this gift of Amazing Combo Gift for Mom will pour out all the unspoken affectionate feelings you have for your mom. 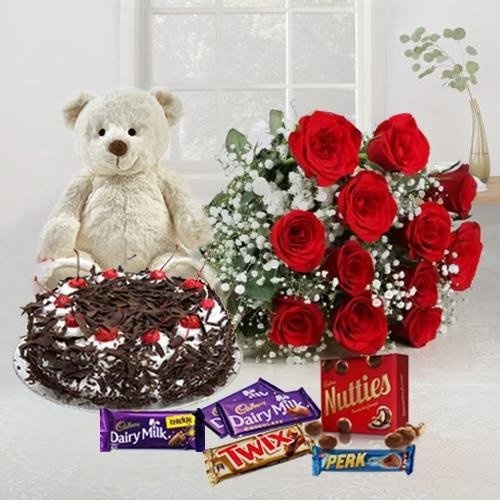 These are 12 Exclusive Dutch Red Roses Bouquet with Cake 1 Lb, Cadburys Assorted Chocolates and a Cute Teddy Bear. We deliver only Freshly Baked Cakes. Bakeries make ready the fresh baked Cake only by 11 AM. Thus all orders of Cake can only be delivered after noon time.